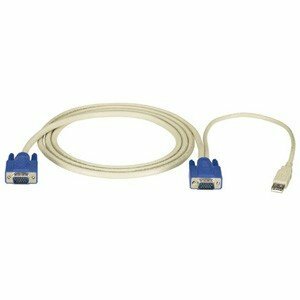 This specially designed cable enables you to connect a ServSwitch EC Series KVM switch to a USB server. Supports USB type KVM connections (USB and VGA) for ServSwitch EC switches with HD15 female CPU connectors. This specially designed cable enables you to connect a ServSwitch EC Series KVM switch to a USB server. Supports USB type KVM connections (USB and VGA) for ServSwitch EC switches with HD15 female CPU connectors. Also available in 10- and 15-foot (3.0- and 4.5-m) lengths.